The keynote address will be delivered by former Managing Director of Vanguard Assurance, Mr. Emmanuel Mahama Baba. There is no denying the fact that the recent banking crisis in Ghana really shook the very foundation of our financial services sector, as a whole. Indeed, the survival of our indigenous banks, in particular, is reeling under the threat of panic withdrawals among others. At the heart of this, is what the Bank of Ghana (BoG) cites to include Corporate Governance failure and bad management practices. Simply put, unrepentant failed leadership! Consequently, the Bank of Ghana has taken steps to sanitize the banking space including the prosecution of directors of the failed banks. Similarly, and akin to our Ghanaian adage of keeping a bowl of water close by when a neighbour’s beard is on fire, other key regulatory bodies like the National Insurance Commission (NIC), National Pensions Regulatory Authority (NPRA), and National Health Insurance Authority (NHIA), have all initiated proactive steps to deepen their respective regulatory regimes, in a bid to avoid a possible spillover effect in their respective spaces. Interestingly, the NIC for some time now, has shifted focus towards a risk-based supervision, which is aimed at enhancing the sustainability and responsiveness of the industry players. For an industry with penetration under a paltry 2%, based on its contribution to GDP, merely redefining a supervisory regime would appear inadequate, as the capacity of players to underwrite large transactions have often been called to question. To this end, the NIC has recently posited the need to increase the minimum capital from its present GHC15m to something in the region of GHC 50m. Indeed, this subject appears to dominate our industry landscape in recent times and the discussion is still ongoing. Instructively, all the players and key actors appear to accept the need for an increment, but with suggestions about quantum and model of implementation. Indeed, at the recent Ghana Insurance Brokers Association (GIBA) annual Conference held in Kumasi, the subject of Minimum Capital Requirement (MCR) was at the heart of their discussions, with varying and interesting opinions. The keynote address will be delivered by an esteemed veteran Insurance Practitioner and a former Managing Director of Vanguard Assurance, Mr. Emmanuel Mahama Baba . To support in the discussions would be representatives from the NIC, the Ghana Insurers Association (GIA), GIBA, Ministry of Finance as well as an authority in the area of Reinsurance. If your MCR is below the required minimum and your CAR is above the required 150%, what are the implications for an industry that needs to be put on some ‘dieting’? Will an increase in the MCR necessarily increase the CAR? With effective risk-based supervision, do we need periodic MCR increases? What will increases in the MCR mean to both corporate and individual professionals in the insurance industry? Is it just a big ticket item which does not impact these professionals? 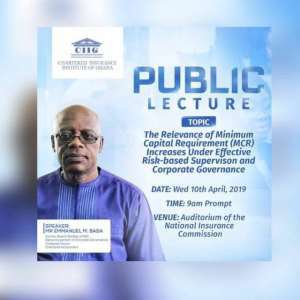 These, among others, will be addressed in this public lecture come Wednesday, April 10, at the Auditorium of the National Insurance Commission at 9am. Insurance practitioners, accountants, shareholders and all other stakeholders including students of Insurance as well as Accounting & Finance are, therefore, encouraged to participate.